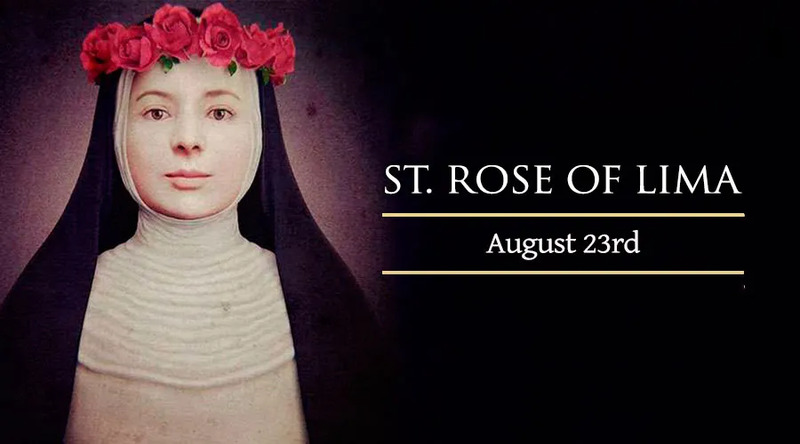 On August 23, the church celebrates the first saint of the New World, St. Rose of Lima. Isabel Flores de Oliva was born in Lima, Peru on April 30, 1586, daughter of Gaspar Flores and Maria de Oliva. She was baptized in the parish of San Sebastián in Lima by the priest, Fr. Antonio Polanco. She was confirmed in the village of Quives de Manos by the then Archbishop of Lima, St. Toribius de Mogrovejo. At a very young age, she chose to consecrate her life to God. She practiced very intense prayer and penance daily, sometimes depriving herself of food and sleep. She joined the Third Order of St. Dominic and lived in a little hut in her parents' garden, working to help support them. She was ill for the last three years of her life, and was cared for by a government official and his wife. She diedat the age of 31 on August 24, 1617, feast of St. Bartholomew, as she herself prophesied. She was canonized by Pope Clement X in 1671, and was the first saint of the Americas. Her shrine, alongside those of her friends, St. Martin de Porres and St. John Masias, is located inside the convent of St. Dominic in Lima.